1. 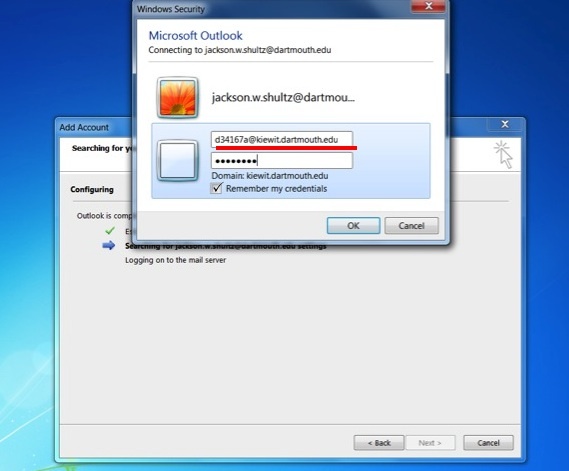 Once Outlook is open, go to the "File" menu and click "Add Account." 3. Type your password and press next. 4. When the pop-up appears enter your NetID@kiewit.dartmouth.edu, followed by your password. Check the box that says "remember my credentials." With the program open, go to the "File" menu and click "Add account." 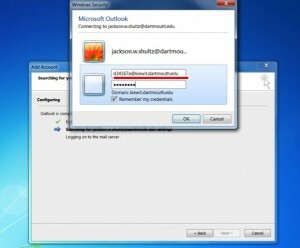 Enter your email address and follow the prompts Outlook provides. 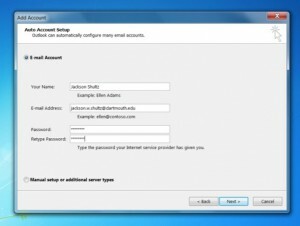 Warning: If you are adding a second email address to Outlook 2013, make sure you are not currently logged into the account elsewhere during set-up (e.g., on another computer or a mobile device). This can possibly cause errors.